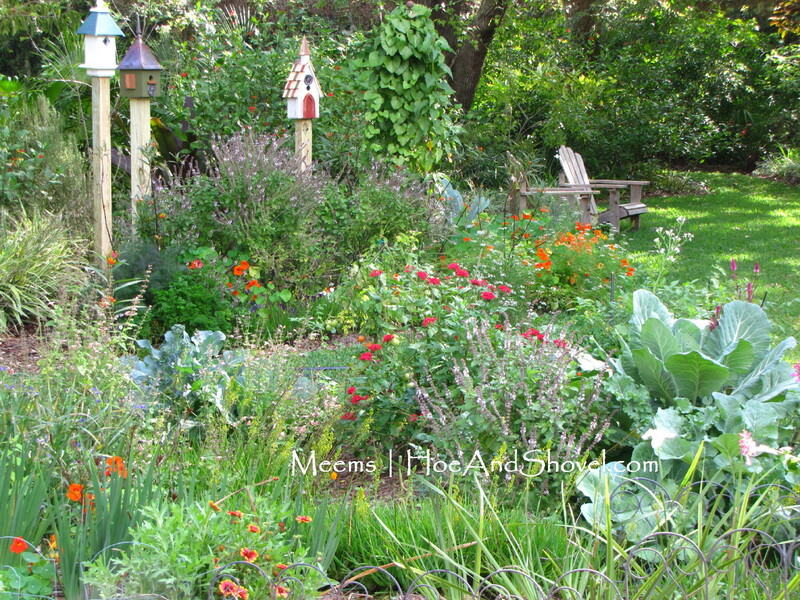 Every garden is as unique as the gardener who creates it. Mine has been lovingly planted with my own two hands and gradually designed with a few significant goals in mind. It is a peaceful place where I toil and pause to center my soul. Most importantly, my family and friends gather here for events and holidays. Last, but not at all least, my garden provides an environmentally friendly habitat for Florida wildlife. 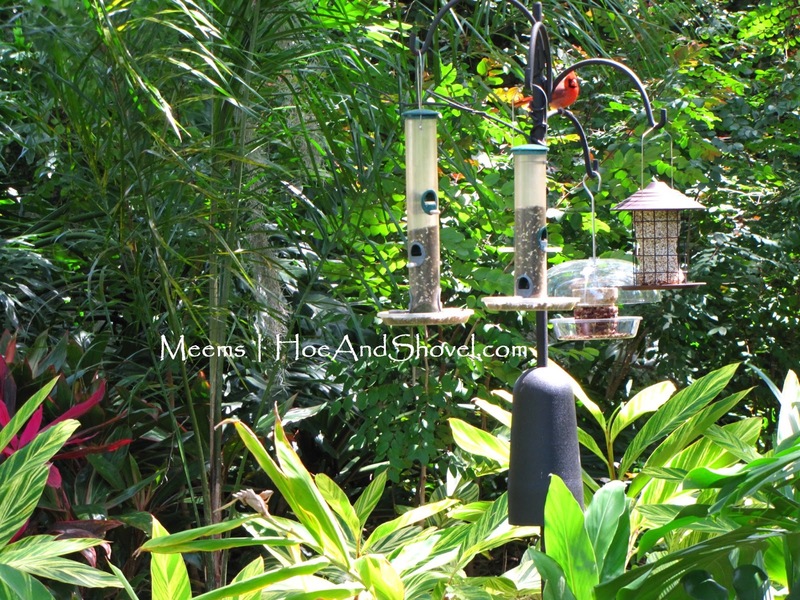 I've been feeding birds at various stations located throughout my garden for as long as I can remember. Watching them come and go to the feeders is amazingly entertaining. Hearing their sweet songs and calls is as delightful as sunshine on a cool day. Just knowing birds are happy in my garden is extremely satisfying. My family enjoys learning the names and specific antics of the birds that visit and nest among the abundant shrubs and trees at my house and surrounding conservation areas. Bird feeder with Safflower seed next to Circle Garden. Florida-Friendly plants blend with Florida native plants in my garden to form an ecological habitat that supplies cover, safety, food and water for wildlife. My style is naturalistic, yet cohesive. My garden is made up of large, sweeping beds (most under clumps of mature oak trees) connected by meandering pathways between specified garden areas with only a small patch of lawn remaining in the back garden. One thing I had not added to my garden is yard art. I've not been much of a fan of random yard art. At least not in my garden. Yard art in some gardens looks like it belongs, much like well appointed furniture and accessories. In mine? Not so much. In my mind, any notion of whimsical additions would have to be kept to a minimum and yet should be significant enough to make a statement that complements the maturity of my garden spaces. I am a big fan of seating areas and functional spaces. I've used decorative cobalt blue pottery containers with good plant combinations to dress up particular spots throughout. That's about the extent of it. Until now. 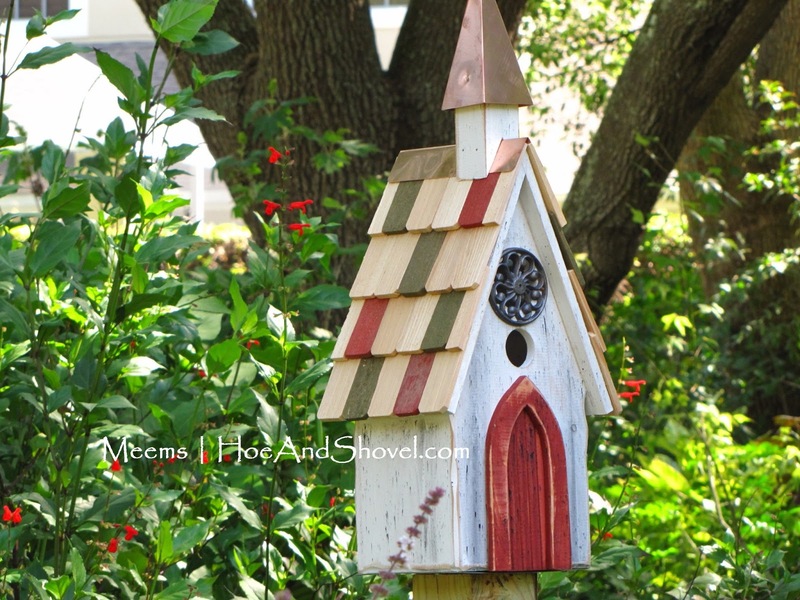 Three new birdhouses in my back garden add a bright spot of whimsy and function. 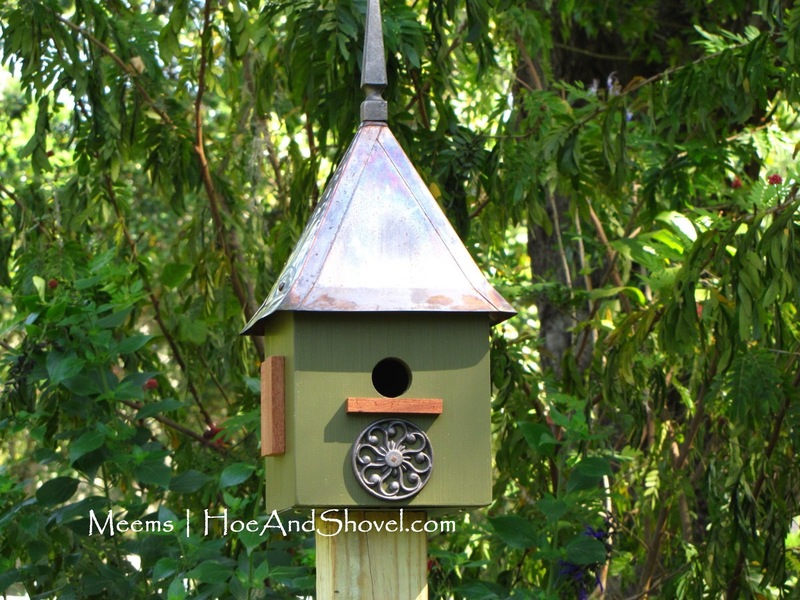 Inspiration from a fellow-gardener motivated me to envision decorative birdhouses for a spring spruce-up in my garden. 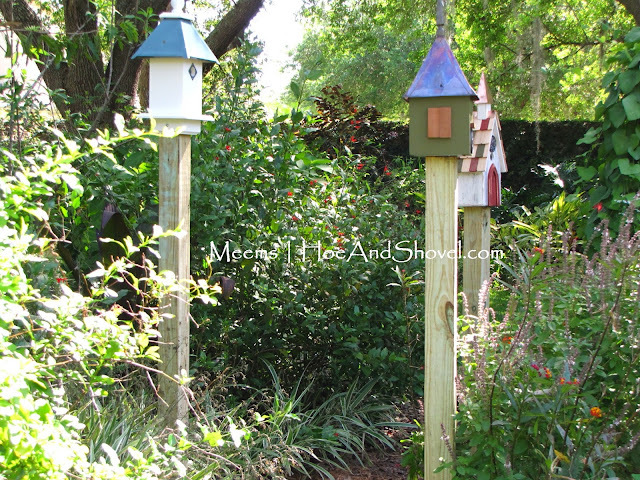 I hired help to install them on 4x4x8 posts cut to different levels for my design. The birdhouses are large. Each one is at least 24" tall or more. Hopefully birds will actually use them since they are decorative and functional. Birdhouses from the side angle. They are situated in a curving pathway between the privacy berm and the sunny cottage border in the back garden. Birdhouses in the morning light. Drainage holes were drilled in the bottom and small doors on the back or side allows for clean out when necessary. The openings are the proper size for small birds to nest. Birdhouses in the late-afternoon light. Which whimsies do you have in your garden? 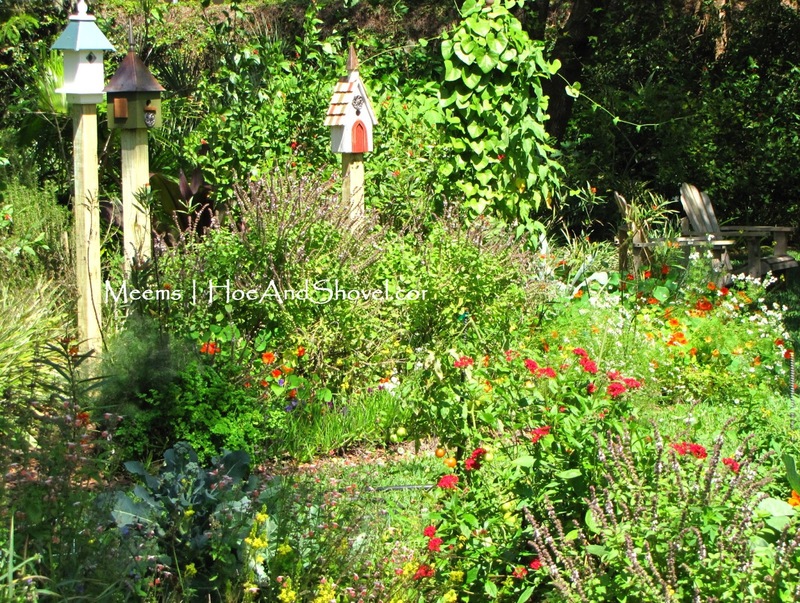 Oh Meems ~ I love your gardens and your newly added colorful and happy bird houses are wonderful. I have quite a bit of 'yard art' throughout my gardens. Some are unusual, some quirky, some lovely. I enjoy my blue bottle 'bouquets' too. 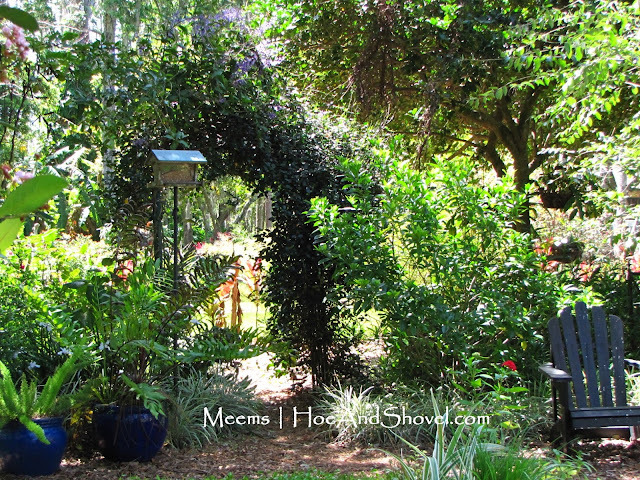 Every gardener has their own style which adds to the beauty of their gardens. Love those birdhouses! You know how much I love yard-art.I love those little surprises they bring to a garden. The new birdhouses look right at home nestled among your beautiful garden. Your opening words resonate so richly with me, I too, feel centered in the garden. Thank you for bringing so much beauty into my day! What fun birdhouses! 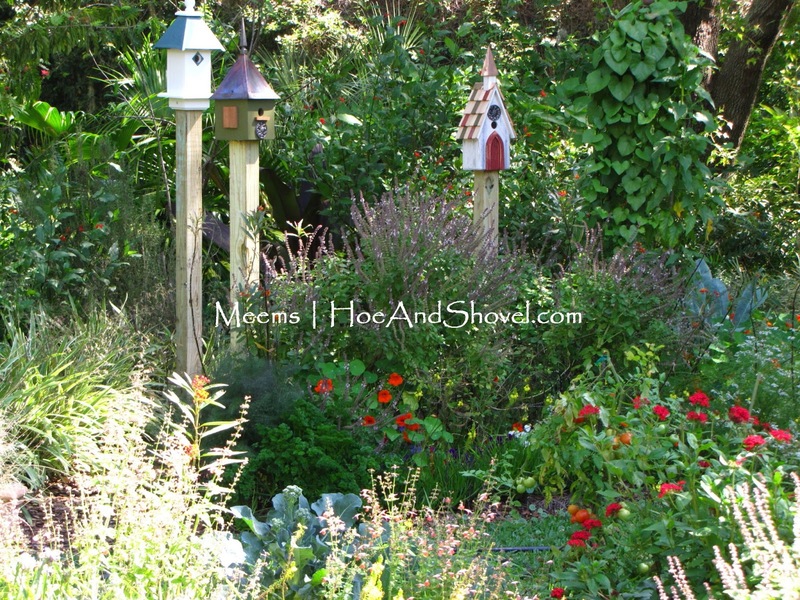 I would love to have something similar, but I fear my garden isnt mature enough for the birds to feel safe. I'm just glad they come to my birdfeeder often. Like you said, I've found the birds make for good conversation with family and friend - particularly with my in-laws. Luvin' these additions! we'uns wanna know when feathered beauties take up residence. Aunty ain't a huge fan of yard art, but I does have a stone bunny, a sundial, a stone frog, a fountain, an' St. Fiacre statue. Uncle keeps a platform feeder fer the birds, an a small bird-water gismo. I reckon we's so used to this stuff, that we doan even notice it as "yard art." seems to me yore bird houses look real natural an' very charmin'! Happy Easter! I was waiting for someone to ask WHERE did you find them?! Too adorable!! i love each one of these pieces of art in your garden. it will be fun to see who takes up residence in them. watching a family of birds is also very entertaining. how the daddy is watchfully protective, the momma going to get sticks and moss for building her nest, then worms for her hatchlings, and the babies once they start emerging. you will love it. i like the idea you had of painting the posts the darker colour...i think they will blend in nicely. happy bird watching. I love the birdhouses! Great choices and they do add such charm to your lovely gardens. I have a small cedar shrine for found objects found while gardening. It holds small toys, marbles and little bits and pieces. I look forward to seeing who is going to make a home in each of these. they look as though they were made for your lovely garden. love the bird houses. The style suits I think. I love the bright colors. 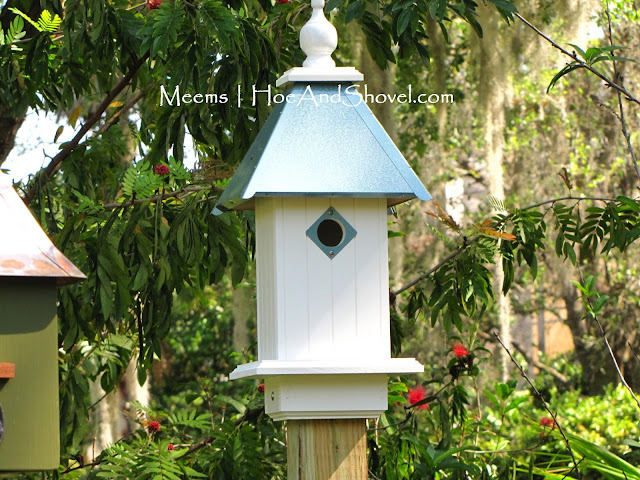 I think the new birdhouses blend very well into your overall design! I think you did great with your birdhouses, but I feel your pain. I often feel that other people are so much better at collecting garden. Still, I try! I'm with you on the yard art, Meems but I love what you've done - it's so natural and function as you said. Gardeners don't get old they just spade away :-) Thinking about me one of them blue bottle trees one day or maybe I'll come up with a new what-not as we called them in 'bama .